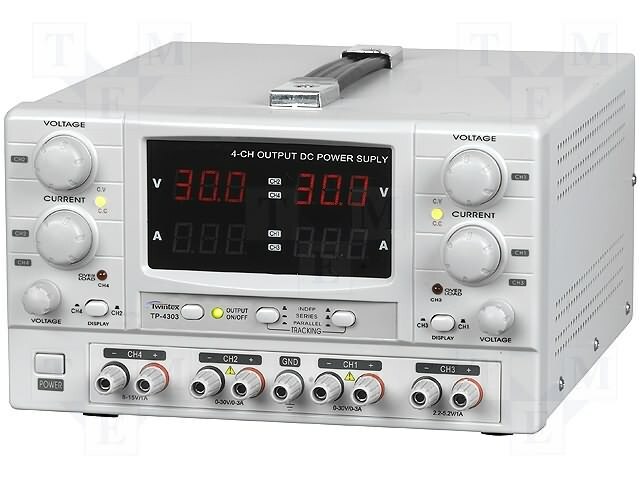 The TP-4300 series includes laboratory PSUs from TWINTEX with four independent, gradually adjustable outputs. They are distinguished by low noise and ripple levels, as well as high stability of operation. The PSUs feature an automatic cooling system that switches the fan on only in case of high loads, minimizing noise levels and protecting against overheating. Furthermore, the overload and short-circuit safeguards protect the PSUs and any connected circuits. The TP-4300 series PSUs can be used in numerous applications, e.g. as a power supply for operational amplifiers, push-pull stages , logic, and programmable systems.